On Sunday afternoon we got back from spending the weekend in Toledo. No, we didn't get homesick for guacamole and blueberry pancakes and take the first flight we could find back to the United States. 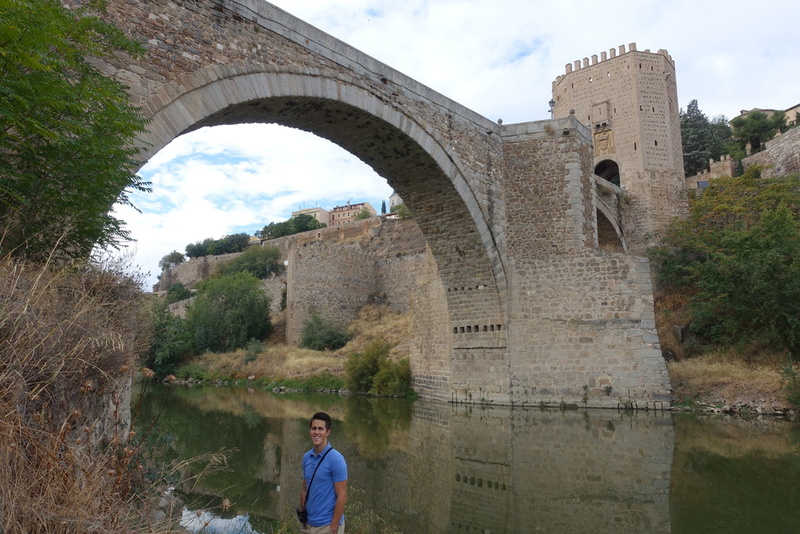 Toledo is a city 70 kilometers (the whole world except for the U.S., Burma, and Liberia uses the metric system, so I am going to try to use this time as an opportunity to get on board with the entire rest of the world, even though it's hard) outside of Madrid with a whole lot of cultural and historical significance. Now, before you are very impressed that we are travelling after only two weeks in Spain and with our (extremely) limited Spanish skills, hear me out. We are still bouncing from Airbnb to hostel to Airbnb and are (hopefully!!) moving into our very own apartment this coming Thursday. However. This past Thursday we were in a place where we needed to figure out where we were going to stay the next night and we had no idea where that might be. We spent hours (from about 5pm to 10pm) scouring hotel sites, hostel sites, picking friends' brains (both stateside and in Madrid), and doing everything we could think of to not spend the weekend sleeping on the streets with our five suitcases. It finally became clear that unless we wanted to spend heaps of money, we should consider the advice of a nice fellow in our hostel: leave town for a couple of days. We looked at Airbnb options in Toledo and two came up. I contacted the cheapest one (we're talking $29 a night here) and had a solid response within a couple of minutes (note: this doesn't often happen). So I looked up train tickets and did a quick Google images search to make sure Toledo was a nice place to go (true story) and I started thinking this could maybe be a good idea. I mean, I don't take much convincing when it comes to travel, but right now we are really pinching pennies, so I wanted to make sure it was the very best choice for us financially. On Friday afternoon, we submitted our research papers for our class, and took the Metro to the train station. The train station was surprisingly confusing, but we were there in plenty of time, and boarded the train with with some a few minutes to spare (the ticket says you must board only two minutes before the train departs!). Thirty-three minutes later, we were in Toledo. We dropped our suitcase off at Owain's, our friendly Airbnb host who lived across the street from the train station, and walked ten minutes into the Old City. So that, in fact, is only the entrance to the Old City. Just that part there felt so...castle-esque and so "we're-really-in-Europe!" to me. 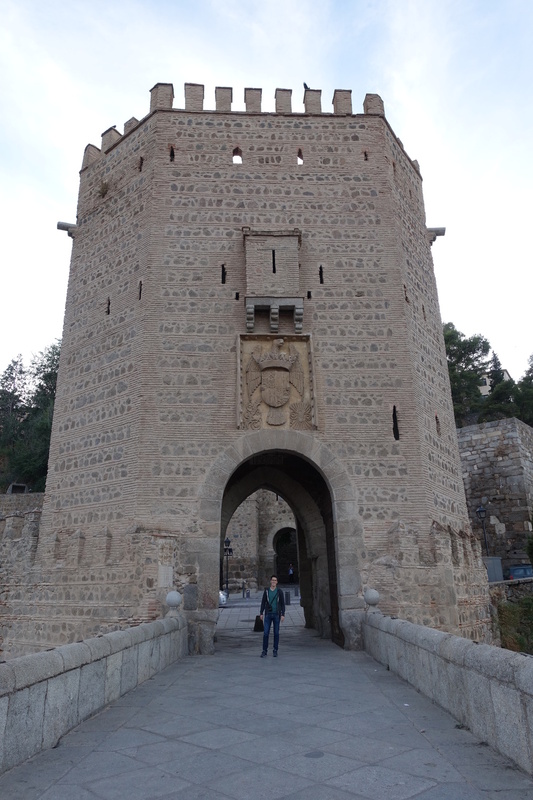 And every time we wanted to enter that part of Toledo, which was about twice a day, we got to go over that bridge and through those gates and up the stairs. So neat. We finally entered into the actual Old City, and wandered from the main square (Zocodover Square, if we're being official) onto some side streets. Everyone who advised us on our last-minute trip to Toledo told us to "get lost in the streets" and to be honest, that sounded so unappealing to us. I mean, get lost? Who likes getting lost? Generally being lost is a negative thing, it means you have done something wrong, you have made a wrong turn, you can't follow directions, you lost the map, etc. We didn't want to get lost! But now that I've been to Toledo, I know that the only thing I could tell someone who is about to go to Toledo is to get lost wandering the streets. The next morning, we accidentally slept in until 9am! What! The sun doesn't come up until about 8:15am around these parts anyways, so we didn't miss too much, and we made our way into the city before long. I'm slightly embarrassed to admit that, after walking along the river for a little bit, our first stop was McDonald's. Not because we wanted to eat their food, but because we wanted to use their WiFi. Our Airbnb host recently moved to Spain and hasn't been able to get his WiFi set up yet (some things are more efficient than others here in Spain...), so instead of enjoying a totally tech-free weekend, we sought out WiFi a couple of times throughout the weekend (covers face in shame). I am now uniquely qualified to tell you about the neat and highly advanced ways of this particular McDonald's, but instead I will just tell you the 1.35 euro croissant drenched in hot fudge (yes, the same hot fudge you might find on your hot fudge sundae in America) we purchased was actually quite good and the WiFi was quite useful for communicating with our soon-to-be landlord and soon-to-be Airbnb hosts, so there was some redeeming uses beyond just scrolling through social media feeds. What next? Well, we wandered. Of course. We found Madre Tierra, a vegetarian restaurant and had lunch (we recommend the veggie burger). 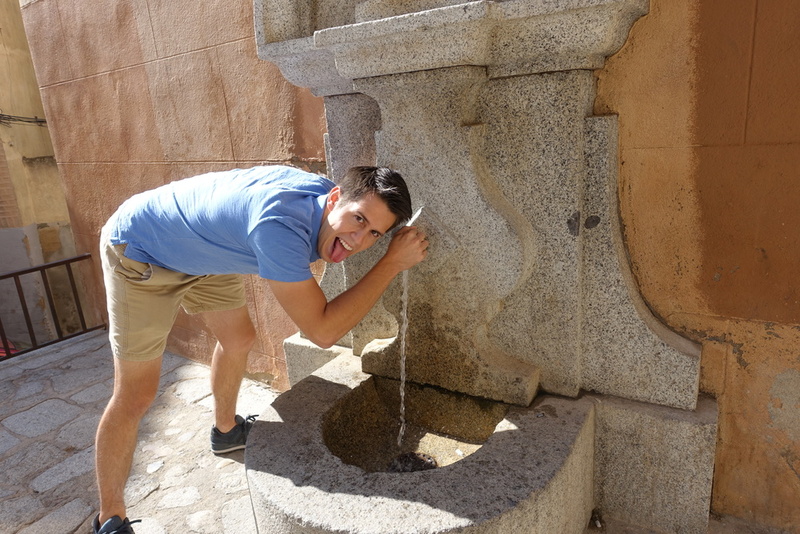 We drank out of public water fountains that seem to be a step below fire hydrants, but hey, we were really thirsty and didn't want to purchase any plastic water bottles. We don't know much about Spain, but we do know one thing: restaurants are not into this whole "agua del grifo por favor" (tap water please) - as opposed to pricey plastic bottles at every meal. They like to tell us it is not possible or they don't have it (???) or just plain no. Regardless, free water is hard to come by, and even this water sort of came at a cost - our whole front sides got soaked every time we took a drink! For dinner in the evening, we bought ingredients at the store and made pizzas at Owain's for about 4 euros. We thought about going back out afterwards but nixed that and decided to just be low-key and go to bed. It was a good call. Predictably, we started out by taking pictures of the bridge (I'll spare you those, though, since I've already shared about 73), walking around a little, and then because there was little else to do, we decided to go to a service at the main cathedral (because we're living on the cheap right now and didn't want to pay 22 euros to get in). We were able to catch glimpses of its splendor during the small, short service without paying a penny, and even understand bits and pieces here and there. Afterwards, we spent a bit more time at McDonald's, as we split a croissant and reunited with the world outside of Toledo thanks to the almighty Internet. We got a bit spendy and decided to tour Santa Maria La Blanca, a synagogue built by Muslims for Jewish use that is now owned and preserved by the Catholic church. We left five euros poorer, but I think we were glad we went, although we did leave not knowing anything more about the synagogue than when we came (I had to look that fact up on Wikipedia just now because it didn't say any of that at the synagogue - they were really lacking in signage in any language). We found another little area we hadn't wandered through before with new views of the river and countryside, and stopped by our favorite little pretty street one more time (Calle sin Salida de San Pedro, in case you ever want to check it out), and grabbed sandwiches at Viandas de Salamanca again (we ate their sandwiches as we walked around on Friday as well). Around 3pm we picked up our suitcase from Owain's, walked across the street to the train station, got on the train about ten minutes before it left, and were back in Madrid by 4pm! It was such a nice weekend. A welcome change of pace from our busy city life, and a great introduction to Spain outside of Madrid. We saw most everything we wanted to see (except the cathedral - I think sometime we'd like to take a proper tour of that), although we'd love to go back with friends/family and show them around if we ever had visitors.